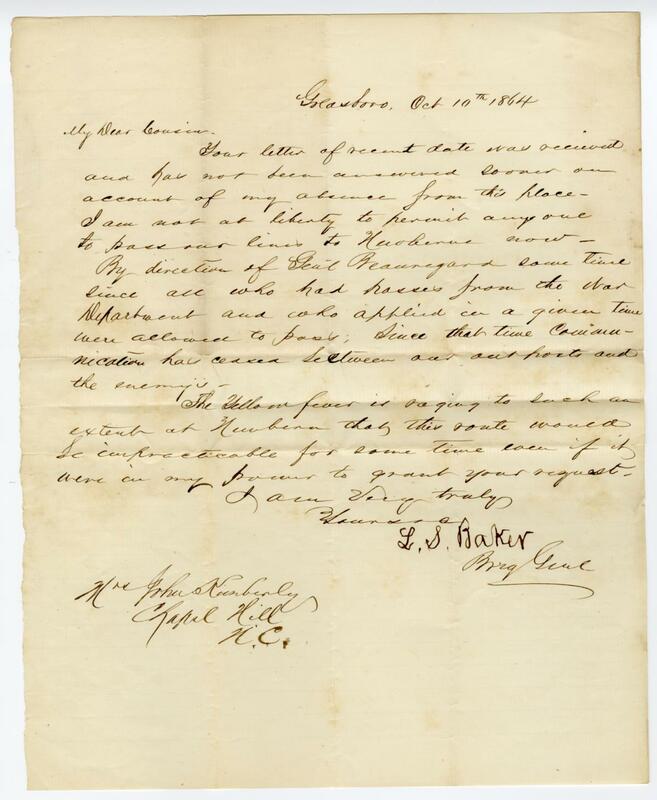 Item Description: Letter from Brigadier General L. S. Baker to his cousin John Kimberly explaining that because of his orders and the Yellow Fever epidemic in New Bern, North Carolina, he cannot allow him to visit New Bern. Your letter of recent date was received and has not been answered sooner on account of my absence from this place. I am not at liberty to permit anyone to pass our lines to Newbern now. By direction of Genl Beauregard some time since all who had passes from the War Department and who applied in a given time were allowed to pass. Since that time communication has ceased between our outposts and the enemy’s. The Yellow fever is raging to such an extent at Newbern that this route would be impracticable for some time even if it were in my power to grant your request. This entry was posted in Southern Historical Collection and tagged John Kimberly, L. S. Baker, New Bern (N.C.), yellow fever. Bookmark the permalink.